Welcome to Putnam County, Indiana, USA! Welcome to Putnam County, our communities and our economic development efforts! Throughout this website you will find a wide range of information about our home. Please explore this website to learn more. We are always available to answer questions. WHY PUTNAM COUNTY? – TO BE CONNECTED! We have a strategic location just 50 minutes from downtown Indianapolis and 35 minutes from Indianapolis International Airport. Easy access to national and international connections! 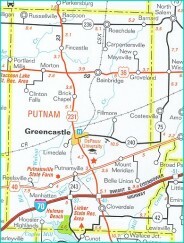 Greencastle and much of Putnam County offers high speed/high bandwidth fiber to the home/fiber to the business Internet connections! Our elected officials are business friendly, responsive, and supportive of new and additional investment. Greencastle, the county seat, is the home of DePauw University and Ivy Tech Community College. Connections provided for lifelong learning! We have skilled and available candidates for employment. A great quality of life made possible by our rural atmosphere, our local universities, and our proximity to the amenities of Indianapolis. Connect with the Colts, Pacers, the Indianapolis 500, the Indianapolis Museum of Art, the Children’s Museum and many others in central Indiana. Connect with markets and much of America’s population within an 8 hour drive time from Putnam County. We have a range of sites and buildings to support a wide range of private investment. Land here and enjoy connections to the world! Indiana is one of the most business friendly states in the nation. Indiana ranks 1st in the Midwest and 5th in the nation as the best place to do business in the Pollina Corporate Top 10 Pro-Business States for 2012 study (August 2012). Indiana ranks 5th in the nation for business friendliness and 7th for cost of living in CNBC’s “America’s Top States for Business” report (July 2012). Corporate Tax Reduction – New legislation cut Indiana’s corporate income tax from 8.0% to 6.5%. The tax rate will drop by 0.5% per year as the decrease is phased in by June 30, 2015. Right-to-Work Legislation – On February 1, 2012, Indiana became the 23rd state in the nation and first state in the Midwest to pass right-to-work legislation. 1st in the nation for U.S. interstate highway access. 80% of the nation’s population is within a day’s drive of Indiana. CONNECT WITH US SHOULD YOU HAVE ANY QUESTIONS! This website is made possble through the financial support of the Economic Development Office of the Indiana Municipal Power Agency (IMPA). The Town of Bainbridge is a member of IMPA and through that membership provides access for the Greencastle/Putnam County Development Center. IMPA is one of the many great economic development partners in the State of Indiana. To learn more about IMPA, please visit their wbsite at www.impa.com.